As the price of sunflower seed threatens to approach the price of “nyjer” thistle seed, I see more and more empty birdfeeders. I enjoy watching a variety of birds visit our feeders both here at Prairie Nursery and at home, and will continue to pay the price for commercial feed, but appreciate even more the “natural” birdfeeders at both locations. Both native shrubs and perennials alike can be bird favorites, drawing a wide range of species. Native shrubs that created nesting habitat earlier in the year boast berry crops that provided a food source from mid summer into winter. Robins, Cedar Waxwings and many others compete with jelly and winemakers for Elderberries. Lowbush Blueberry is prized by both birds and humans as well. Other fine natives such as White Snowberry are best “left for the birds”! 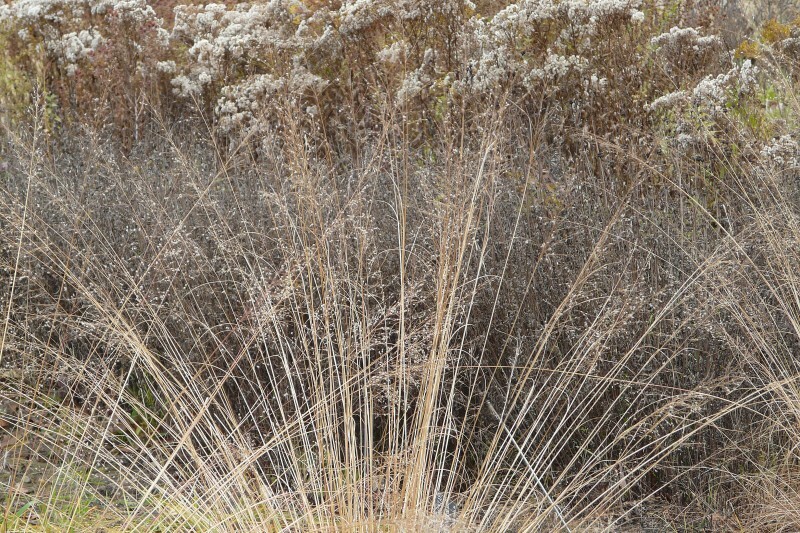 Native perennial flowers and grasses can also provide year round interest, and we advocate leaving them standing through winter. 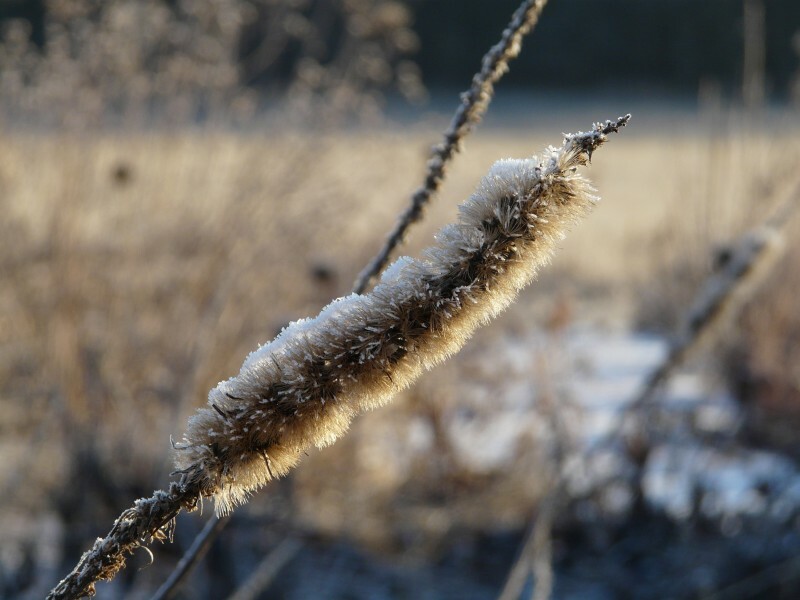 Early season frosts on coneflowers, striking hues as native grasses turn in autumn, fresh snow collecting on stems and leaves all provide stucture and visual appeal. As our eyes appreciate this, so too do Chickadees, Finches and Cardinals. Beginning with Prairie Smoke, an early summer Goldfinch favorite, native plants, when left to “go to seed” are a prime food source for birds. Species such as Blazingstars, Silphiums and Sunflowers are so popular among Finches that they begin to pluck seeds out before they are ready to harvest here at our nursery! 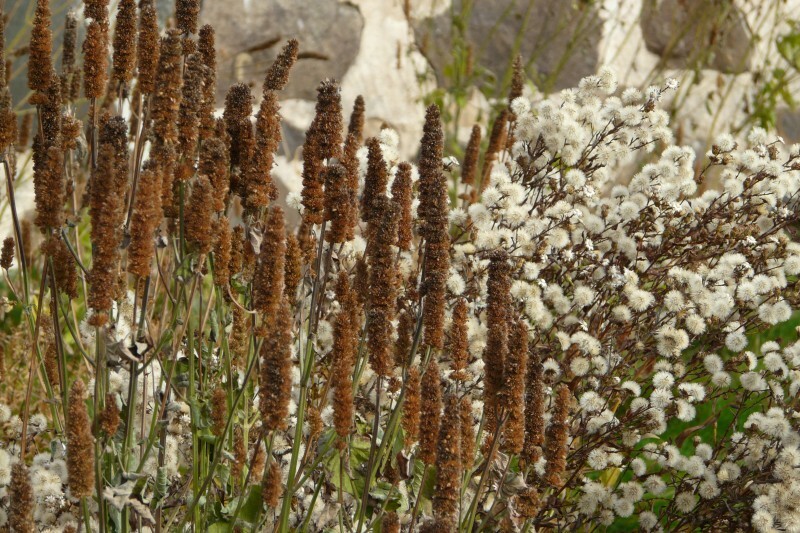 Coneflowers, Bergamot, Dotted Mint, Lavender Hyssop, and many of the native grasses are among other favorites, and often retain some of their seed after the first snows to be enjoyed by Juncos, Tree Sparrows and in larger plantings, Snow Buntings. These seed source plants provide cover for birds as well, both from the elements and predators- add a few choice selections to your plantings, and leave them standing until spring! Thanks for the information. I already knew about some of the plants, but didn’t know that birds eat from prairie smoke or bergamont. I deadheaded my bergamont hoping it would bloom more, but it didn’t. I have a huge variety of blooms that I wait until spring to clean up so the birds can get whatever seeds they want. Thanks Sue, Deadheading plants will certainly help encourage many plants to bloom again. I have not had success dead-heading Bergamot or any of the mint family to encourage more blooms. I have found deadheading works quite well for Coneflowers, Coreopsis and sunflowers. Enjoy your time in the garden! Great idea, Jean- we’ll get more creative this winter- I’d be interested to see photos! Another reason to leave natives stand through the winter – snowman parts! 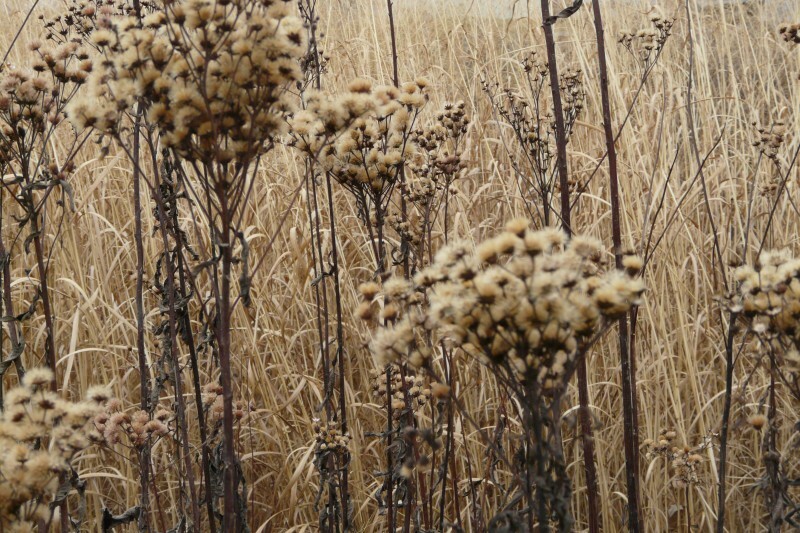 Cupplant stalks make great arms; purple coneflower heads make great eyes and buttons; etc.